Industry studies of project management performance indicate that project risk management is the weak link of PMI’s PMBOK (Papke-Shields, Beise, Quan 2010). These studies show that project managers tend to consider risk management a “soft” skill and theperception is that the risk management discipline lacks effective tools. On the other hand these same studies show that, when performed well, project risk management increases the chances of project success significantly. Given the historically poor performance of Information and Computer Technology (ICT) projects in meeting stakeholder expectations, this should be a topic of keen interest to most project managers. The root cause of the problem can be traced to the 1970s through 1980s. As the overwhelming influence of engineering/construction rapidly gave way to the IT and software related project paradigm, the traditional project risk management tools failed to capture the nuances needed for the newer, emerging project management culture. Software projects (especially application development) necessarily carried a level of ambiguity that was historically missing from even the most challenging engineering/construction projects. One can visually verify that a skyscraper is progressing according to a build plan; but one cannot visually determine if a source code resting on a piece of silicon is being built to plan. So, it has been the inability to rely upon visual inspection of the final work product that made and continues to make Information and Computer Technology (ICT) projects so risky as investments. To a great extent the project management paradigm has yet to come to terms with the need for change and to adopt a different set of risk management requirements that must capture the nuances of today’s ICT that enable business transformation projects. Project managers are still trained and evaluated on the same limited set of standard tools such as risk registers, Monte Carlo simulation and the like just as those of the generation prior. Since 2008 we have been changing the way risk is being managed on technology projects. Our product PRIMMS® (which is an acronym for Project Risk Identification Measurement and Mitigation System) is a web based SaaS project/portfolio management tool. PRIMMS® adds both data science and social science dimensions to the project risk management paradigm in order to make a more effective process for current generation projects. The operational objective of PRIMMS® is to provide project and portfolio managers with the earliest possible insights and awareness to emerging risks while minimizing false alarms. This becomes a maximization problems that is best illustrated using the Receiving Operating Characteristics (ROC) curve (Figure 1). As shown in Figure 1 our risk management design works to provide high sensitivity (Y ordinate) that detects true positives (true positive meaning that the system accurately predicts that a project is actually at risk) while simultaneously delivering high selectivity (X axis) that minimizes false positives. False positives refers to a situations where the system erroneously signals a risk is present when, in fact the risk does not really exist. So the risk management value proposition is very clear. We want a risk management system that accurately predicts emergent risks as early as possible so that management can take preventative and corrective actions as appropriate, and we want a degree of confidence that project teams are not wasting time and resources chasing false alarms. As can be seen from the example using a training dataset of N=27 projects, the PRIMMS® design classified 25 true positives with 2 false positives. The operating design of PRIMMS® is based upon a very straight forward principle of information gain and the reduction of information entropy. We seek to capture and utilize all of the information available in a project environment. We capture critical information from the project environment, statistically analyze the information and compare it that against benchmarks, provide clear graphical displays and automatically trigger risk notifications as certain thresholds are passed. We also leverage the full benefit of a SaaS web-based system to enable collaboration heuristics on this process. The PRIMMS® approach is a dramatic departure from the standard risk management processes that leave valuable information on the table. The PRIMMS® design taps information embedded within the social interactions and communications within project work environments between team members, senior stakeholders, vendors etc. The information within these interactions provides valuable insights toward risk once the information is mined, analyzed statistically and presented clearly to stakeholders. And this is exactly what PRIMMS® does. The key feature of the PRIMMS® design is a recurring assessment process of the project team and stakeholders. The documented success of this approach goes as far back as D. Nadler 1976 (Survey Feedback as an Organizational Development Techniques) to 2006 when the general technique became referred to as “Crowdsourcing”. 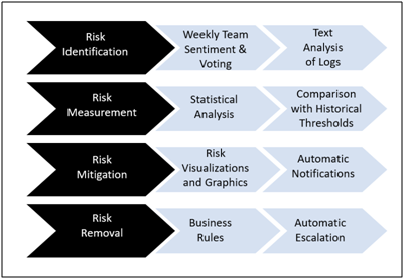 Key elements of this process as used in PRIMMS®, shown in Figure 2, include weekly sentiment tracking and voting, text analysis of key documents, statistical analysis and comparison with historical project benchmarks, automatic risk triggers, automatic notifications and escalation. The PRIMMS® process of utilizing historical benchmarks and tapping the “Wisdom of the Crowd” (AKA Voice of the Team) on a recurring basis significantly strengthens the risk management process for the most complex of modern day ICT and Business Transformation Initiatives. We suggest that you give it a try.